Notes Wheaton Bank & Trust will pay the FDIC a premium of 0.4 percent to assume all of the deposits of Wheatland Bank. In addition to assuming all of the deposits of the failed bank, Wheaton Bank & Trust agreed to purchase essentially all of the assets. Notes First Midwest Bank will pay the FDIC a premium of 1.0 percent to assume all of the deposits of Peotone Bank and Trust Company. In addition to assuming all of the deposits of the failed bank, First Midwest Bank agreed to purchase essentially all of the assets. Notes Northbrook Bank and Trust Company will pay the FDIC a premium of 0.4 percent to assume all of the deposits of Lincoln Park Savings Bank. In addition to assuming all of the deposits of the failed bank, Northbrook Bank and Trust Company agreed to purchase essentially all of the assets. Notes MB Financial Bank, National Association agreed to purchase essentially all of the assets. Notes Republic Bank of Chicago will pay the FDIC a premium of 0.00013 percent to assume all of the deposits of Citizens Bank&Trust Company of Chicago. The FDIC as receiver will retain most of the assets from Citizens Bank&Trust Company of Chicago for later disposition. Notes Harris National Association will pay the FDIC a premium of 0.01 percent to assume all of the deposits of Amcore Bank, National Association. In addition to assuming all of the deposits of the failed bank, Harris National Association agreed to purchase essentially all of the assets. Notes Whidbey Island Bank paid the FDIC a premium of 1.0 percent to assume all of the deposits of City Bank. In addition to assuming all of the deposits, Whidbey Island Bank agreed to purchase approximately $704.1 million of the failed bank's assets. Notes Union Bank, N.A. paid the FDIC a premium of 2.0 percent to assume all of the deposits of Tamalpais Bank. In addition to assuming all of the deposits, Union Bank, N.A. agreed to purchase essentially all of the failed bank's assets. Notes Center Bank paid the FDIC a premium of 0.5 percent to assume all of the deposits of Innovative Bank. 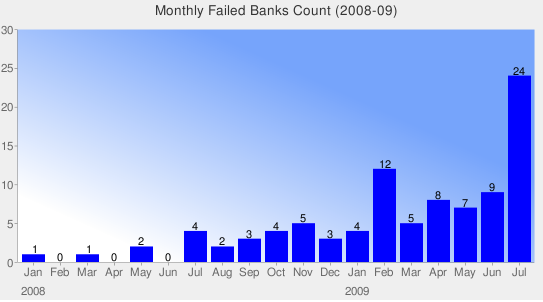 In addition to assuming all of the deposits, Center Bank agreed to purchase essentially all of the failed bank's assets.